Our Kimchi has over 15 healthy ingredients to make one jar of Kimchi. those are used to make the basic broth and the kimchi paste. 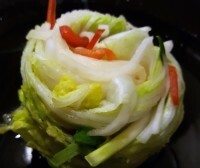 to produce small batches of cabbage kimchi. Our kimchi is known for the refreshing taste regardless of its fermentation stage. That is because we give full attention to every step of kimchi making from washing to fermenting. We do not use any artificial additives. There are 2 cups of sugar to produce 120 pounds of cabbage kimchi. That calculates into .048 teaspoon of sugar in our 16 oz. kimchi container. We compensate sweet taste with lots of fresh apples and onions. We use sea salt to salt the vegetables. After the salting process is done, vegetables are rinced twice and salt water is drained in 2 to 24 hours. This keeps the sodium level as low as possible in our kimchi. We do not use any salt in our seasoning. 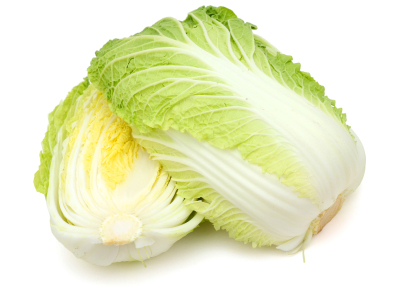 White Cabbage Kimchi does not have any spicy content but it still has the refreshing effervescent taste. 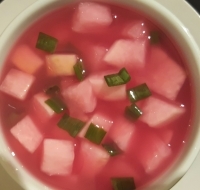 A mixture of julienne cut red bell peppers, radishes, and green onions are inserted between cabbage leaves and fruit based juice is poured over cabbages for fermentation. 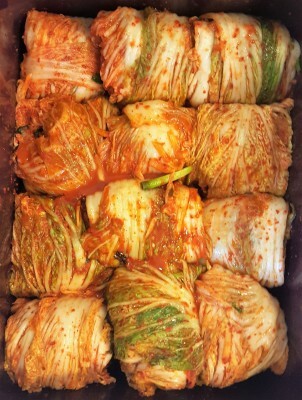 A whole cabbage Kimchi is a quartered cabbage that is marinated with our Kimchi paste. 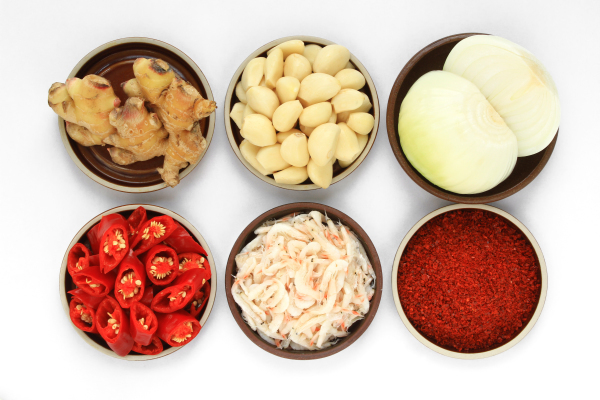 Our Kimchi paste is made with fresh vegetables, herbs and many other nutritious contents. 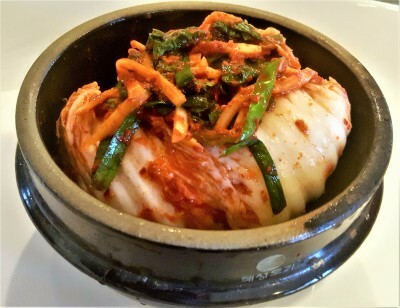 It has a spicy kick but as the kimchi matures more, you will taste less of spiciness and more of effervescent taste. Red mustard leaf kimchi is marinated with our kimchi paste. Spicy kimchi paste accentuates the bitter and refreshing taste of mustard leaf to perfection. 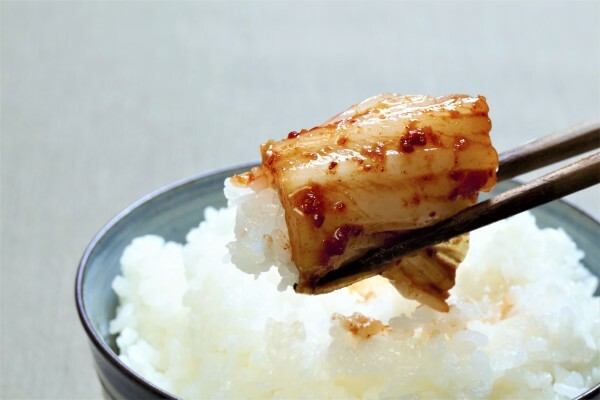 Radish kimchi is made with Korean radish that is rich in flavor and juice. Radish kimchi uses the same kimchi paste as the other spicy kimchi but once it is mixed and fermented with raidish, it brings a distinctive flavor that people love. If you like radish, but cannot appreciate spicy taste or fish sauce, this is the kimchi to have. 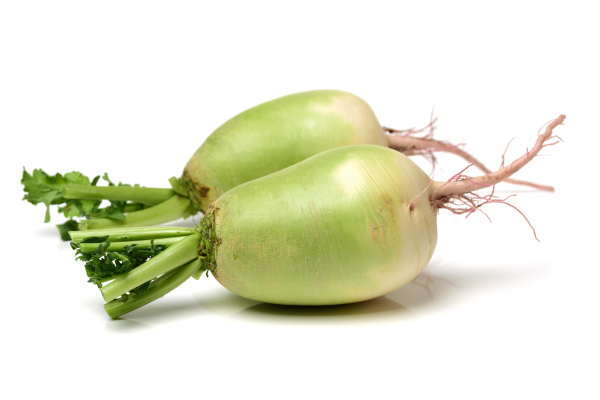 Radish is fermented in kimchi juice that is full of Lactobacillales. Its pickled taste does not come from vienegar (kinchi does not use vinegar) but from natural process of fermentation as all the other kimchi. Cucumbers are stuffed with our own kimchi paste mixed various herbs and vegetables. 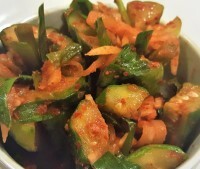 Unlike other kimchi, cucumber kimchi is best when is freshly made to enjoy the refreshing taste cucumber. Many customers asked what they should have kimchi with. You can have kimchi with anything and everything, but my favorite combo is kimchi with BULGOGI. Bulgogi is a Korean beef dish that you can pan-fry, smoke, or bake. Sliced rib eye is marinated in soy sauce, sugar, sesame oil, fruits and vegetable extracts. BUGOGI is available in a 1 pound package that is cooked and frozen. All you need to do is thaw it and warm it up. 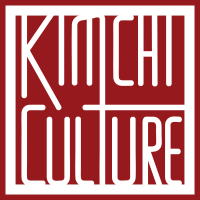 ​You can subscribe our Kimchi. 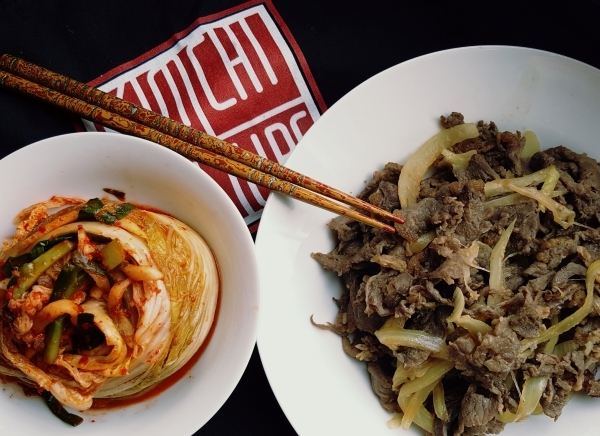 Some customers will find Kimchi as a fixture to every meal. If this is the case, you will consume more than 32 oz. of Kimchi per week. For regular customers, we can design a suscription program that a customer can benefit from the most discounted price. Ancient Mecdical Journal in Korea writes that chives is a vegetable of the liver. 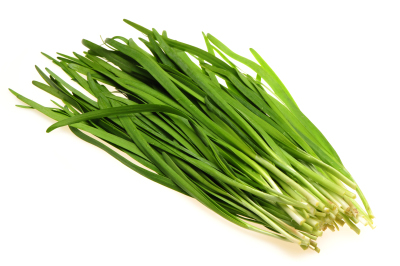 Chives is rich in vitamin A, B, C , carotene, and iron. Its nutrients helps with blood circulation and strengthens digestive system. 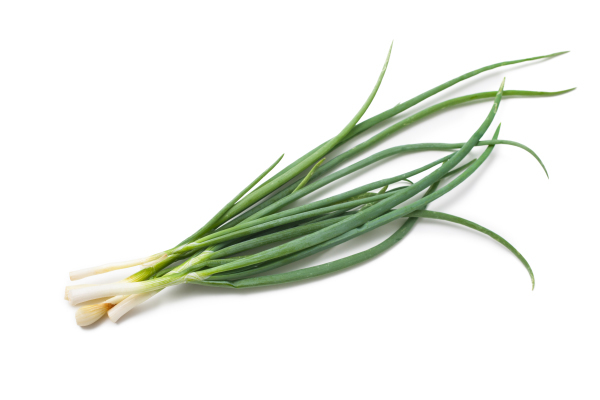 In herbl medicine, chives have known to relieve stress and to warm abdomen area to work as an effective stamina food. chili peppers, and extracts from fruits and dried seafood. Capsaicin which gives a spicy flavor to chilli pepper power works to increase appetite, keeps body heat, and cleanse bowel. Chili peppers are rich in vitamin C. Its vitamin C content is twice as much as orange and 30 times as much as apple. Red ​Mustard Leaf is also used as one of the ingredients when avaiable in market. Air and Temprature are 2 ciritical elements to keep Kimchi Fresh. Exposure to air will minimize the time to keep Kimchi fresh. 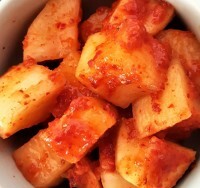 Keep Kimchi in an airtight container. The best way to preserve Kimchi is to make sure that Kimchi is packed down under Kimchi juice covered with plastic wrap. This is the reason why we only send whole cabbage Kimchi. Once it is cut into pieces, it is exposed to air. Cut Kimchi as needed and keep left over kimchi from werving in a separate container. An ideal temperature is 34F which is a normal refrigerator temperature. Simple and Easy Way to Serve Kimchi: Use Scissors!! I know it is an unconventional way to serve food. But Kimchi will temporarily stain your cutting board with orange pepper juice and it can get quite messy with juice spilling all over your kitchen. Put on a disposable glove on one hand to grab Kimchi by its stem and cut Kimchi with scissors to place on a serving plate. 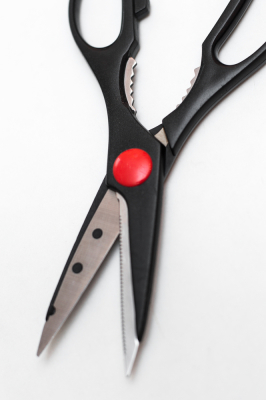 You can actually use any scissors. But please make sure you use that scissors just as a kitchen tool.